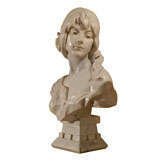 This Mao Bust with Cutlery is no longer available. Exceptional bust of Mao by Alben. Inclusion of antique cutlery. Work signed underneath. Material: Resin and metal cutlery. Paul Louis Gastaud (20th century) Radio telephone Hi Fi chain embedded in an ABS phone Signed. Measures: H 126 × Ø 41 cm. Fully functional a rarity wild design. Porcelain cultural revolution bust of Mao Tse Tung. Fantastic historic political decorative object. 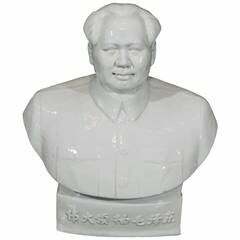 A large 1960s cultural revolution porcelain bust of Chairman Mao. A great historical artifact with an imposing presence. Beijing, circa 1960s. CR751. China Porcelain Mao Tse Tung Front inscription: “Mao President was in Hu Nan visit” Back inscription: “October 1958”. 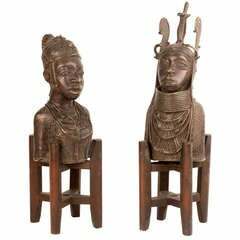 A Nigerian wedding couple in elaborate ceremonial headresses and attire seated on Japanese teak "x" stretchers, especially created for a South Carolina estate, private collection. 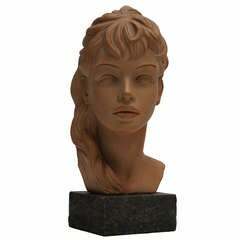 Eastern Isle inspired hand carved wooden bust.